Welcome to the E.T. 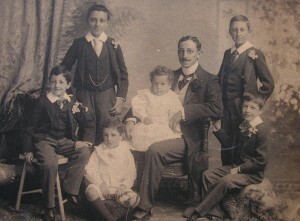 Agius family website, dedicated to the memory of five remarkable brothers – from one extraordinary family. Edward Tancred and Maria Concetta were married in Malta in 1873 and soon after set up home in Hampstead, London. They went on to have fifteen children, two sons dying in early childhood. Four of their daughters married Maltese gentlemen and settled in Malta; the youngest daughter married and lived in Gibraltar. Edward was a ship owner and coal merchant. He travelled extensively throughout Europe, Russia and across the Mediterranean and was well placed more than most to notice the war clouds gathering ominously on the horizon. The five youngest children – all boys – were educated at Downside School in Somerset. At the start of August 1914 brothers Alfred and Arthur were already in uniform – as officers in the Third London Regiment, Territorial Force – and Edgar was soon to follow suit. Tancred – by then a young Monk at Downside Abbey –completed his training for ordination and went on to serve as a Chaplain to the B.E.F. in 1917 – 1918. All four brothers saw service on the Western Front and survived the war, despite being wounded in some of the bloodiest conflicts. They were mentioned in despatches and two won the M.C. Richard, the youngest of the family, completed his studies at Downside in July 1914, aged 17. In September he turned 18 and lost no time in obtaining a Commission in the London Regiment. He saw his first action at Gallipoli (Suvla Bay), and eventually joined his brothers on the Western Front in spring 1917. Richard was killed at Poelcappelle, near Ypres, on October 26th 1917, aged just 21. Had he survived the war it was his intention to become a monk at Downside Abbey.